This cookie was given to me by a friend. Today is a great Thursday. There is not too much going on in my world so, I would like to take the opportunity to say Gracias or Thank you to all those who visit this blog. So, here's to you the ones you wander by, have a look and to those who decide to comment and or compliment. You are all greatly appreciated. Gracias my friends. Hope you are all having a good day. yummy cookie :( There goes my diet. Gonna go hunt down a cookie or 10. 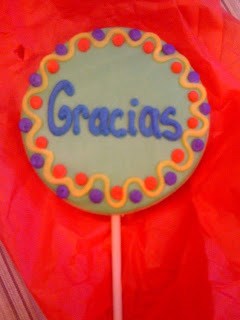 ¡No, gracias! Ha sido un placer de conseguir para saberle por sus escrituras diarias, por las fotos, y por compartir del sentido bueno. ¡Y otra vez, gracias! In other words, "No, thank you! It has been a pleasure to get to know you through your daily writings, photos, and sharing of good sense. And again, thank you!" Have yourself a fantabulous weekend! A good day to you to.